Back in my newspaper days I had strong opinions about blogs and bloggers. As a reporter who had spent decades in southwest Florida developing reporting skills, creating a reputation, establishing credibility and striving to follow what I believe to be the rules of fair reporting I sneered at those I saw as playing at it. There is a snobbery in the newsroom that views most outside the sanctum as at best uninformed and at worst proselytizers. And there is a certain justification. A good reporter – there are fewer now but they do still exist – has an unwavering commitment to truth, accuracy and fairness. Honesty and fairness are traits that must run true to a journalist’s core. It’s more than part of a job description – in the good ones it’s in the genetic makeup. The problem comes in holding a blogger to that standard. It is incredibly easy to write a blog. “Any monkey with a keyboard” is a phrase I have turned many times in conversations about blogging. And it remains true. 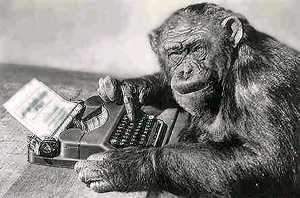 Any monkey with a keyboard can write a blog. Many do. Some strive hard to be accurate and unbiased and some don’t. Some are straightforward in stating their opinions and telling readers that’s what they’re doing. Well my shoe’s are getting wet, but it’s not raining. “Obama hates America” and “Bush was an idiot” are opinions. No matter how strongly a writer may believe it an opinion is not a fact. In these lines I will report facts. When I decide to stray into expressing my own opinions I will tell you so. If you’re a true journalist it doesn’t matter if you’re liberal or conservative, Democrat or Republican or independent. I flatter myself that people who have read my almost three decades reporting did not know my own feelings or opinions. I believe a journalist’s allegiance must be to journalism. First. Last. Only. Granted it has been more than three years (THREE YEARS?!) since the newspaper business spat me out. I have consulted. I have built. I have even made a run at elected office. One of my biggest problems with campaigning was my instinct against expressing my own opinions. My tendency was to examine all sides of every issue and make every effort to understand and respect every opinion. Instead of offering sound bites I wanted to discuss issues and points of view to reach some sort of understanding. In politics? What the Hell was I thinking about? Anyway the truth is none of those things felt exactly right. I liked helping people as a consultant. I think I was able to get things done. There are things I made happen that few know about, and that’s fine with me. I think my almost 30 years studying local governments and politics could be put to successful use. And I love building things. I have always worked with my hands and with tools, and I’m good at it. I believe hard work is a good thing. Grandma used to say “Hard work is its own reward” and she was right. When I worked as a reporter full-time I strapped on my tool belt on a regular basis and still do. The Good Lord willing (Grandma again) I’ll keep doing it. But there is other work to do. The news industry has changed markedly over the past few years. Many of us dinosaurs refused to see the change until it fell on us like an extinction event asteroid, but the old ways are gone. The new ways are, well, new. Newsrooms are not what they were. There are fewer reporters doing less reporting. Streamlining (don’t you love that euphemism) and bean-counting have left smaller, less-experienced staffs to do the important work of keeping the public informed. Too often these lesser newsrooms don’t see something or don’t really understand what they do see. When more than one newsroom had more than one set of experienced eyes on local events people were better informed. Today that’s not happening. People don’t know what’s going on in the halls of government, in the boardrooms, in the courtrooms or on the streets. That’s not OK with me. I have always believed that people should be as informed and educated as possible. An informed populace is an absolute necessity for a functional free society. Right now we don’t have that. So I will spend my time and my effort trying to keep the populace informed. I will make every effort to provide an accurate, complete and balanced look. Whether I am just one more monkey with a keyboard you’ll have to decide for yourself. Kudos to you Charlie! Can’t wait to see what’s next! Great beginning! I like the layout! and I couldn’t pass on the monkey! Perfect beginning…..and on first day of Fall. Loved it! Thanks Steph. See you soon. Will be looking forward to following your blog. Great start! Congratulations Charlie. The only true reporters left seemed to be at the little independents. I cancelled my subscription to the Snooze press ages ago. They don’t want to report news they just want to bs about a bunch of fluff and human interest. We need an informed and involved populace. I guess it’s up to you. Good luck. Thanks Gayle. It’s up to all of us to be informed. No one said it was easy. I’ve actually given that some thought. Right now I’m kinda loving being on my own. If this ‘works’ there’s no telling where it might end up. I can certainly relate to the joy of doing your own thing!